A mezzanine system is a heavy duty industrial platform that has many uses. Here at Panel Built we pride ourselves in providing some of the best building systems in the industry. 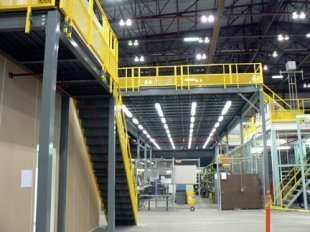 A mezzanine has many uses in a plant or facility. They convert wasted vertical space into a productive work environment. Many people often overlook how useful a mezzanine system truly is, and the potential they have to create a more productive work environment. What are some Uses for Mezzanines? If you’re looking to purchase a mezzanine, what can you use it for? Well, the structural integrity of a mezzanine is very unique. They are able to convert a vertical space into usable space. A mezzanine can be used a variety of ways. In fact, retail spaces have used mezzanines for storage and floor space. Other facilities and plants use a mezzanine to create another productive work space above the factory floor. Still other people may use them to have an office building right in their facility, or as a raised platform to oversee the work. The unique design of the mezzanine not only makes it valuable since it converts that extra vertical space into an area where you can have an office, place of storage, or a more productive work environment. It’s a cost effective way to expand without having to build outwards. Here at Panel Built we completely understand needing more space. When your facility or plant begins to move large amounts of product. Your probably need more room, space, and be able to move product around or store product during expansion. Instead of going all out to expand the building of your plant or facility for more ground space. A mezzanine is a cost effective solution to the problem. Think about how tall your building is. Do you make use of that tall space? In many cases the answer is no. So, a mezzanine gives you the option of being able to expand your floor space without having to spend possibly thousands of dollars on construction. 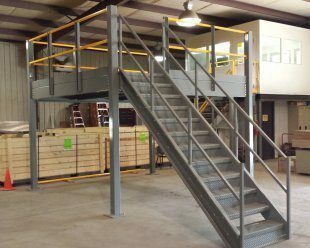 Even if you are expanding your building, having a mezzanine can maximize the space every way possible. If you’re worried about the mezzanine you’re ordering will not be a good fit for your facility. Don’t be, because at Panel Built we are always more than happy to work alongside our customers for what they need. We can build a mezzanine to your specifications so you get the one you need. Our mezzanines are engineered to be tough. They’re able to withstand two story construction and can even meet military space specs MIL-B-28658D. Due to their rugged design many of our customers have used their mezzanines in a variety of ways. Some have used them as catwalks so they can easily get above the plant floor to observe what is going down below, or to simply move around easier. Yet others have used them for conveyor integration to increase production in certain areas. Still, other people use them as platforms for in-plant offices, operating spaces, and industrial platforms. The possibilities are limitless. No matter how you want your mezzanine to look or what you need it for. You can customize it as much as you want. Everything from the custom sizes, stair systems, heights, landings, spans, and decking materials. You’ll be more than happy to know your mezzanine will be designed with only the highest quality, lowest maintenance materials we have available. Mezzanine systems have a variety of uses. This makes them versatile in their use, and leaves them open for a variety of options. Even if you decide to use your mezzanine space for something else at a later date. You’ll be happy with your investment to expand your floor space. They’re a truly cost effective way to make use of your vertical space without having to spend thousands of dollars on expanding your facility or plant. We also offer a free drawing and quote as well. So why not find out how much you can save on your mezzanine system today?